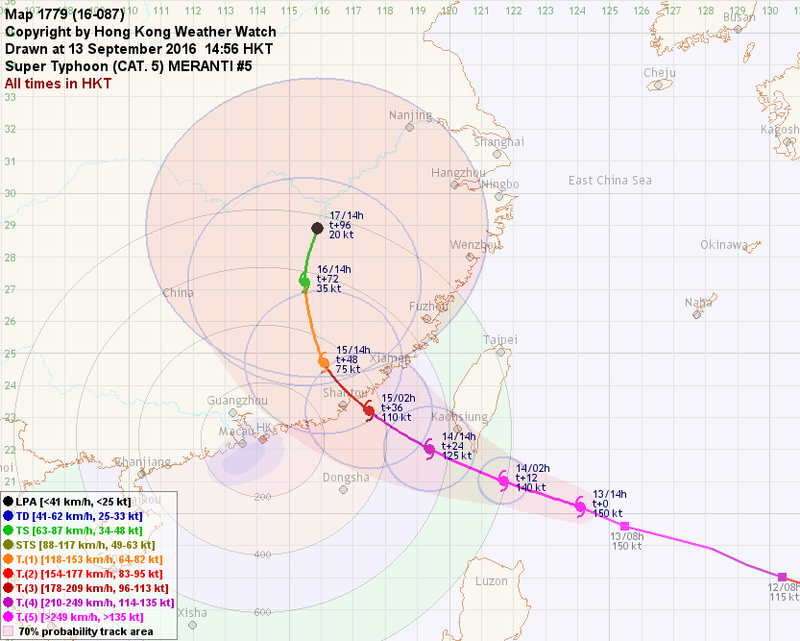 MERANTI made landfall near Xiamen earlier today, and has weakened quickly into a severe tropical storm. 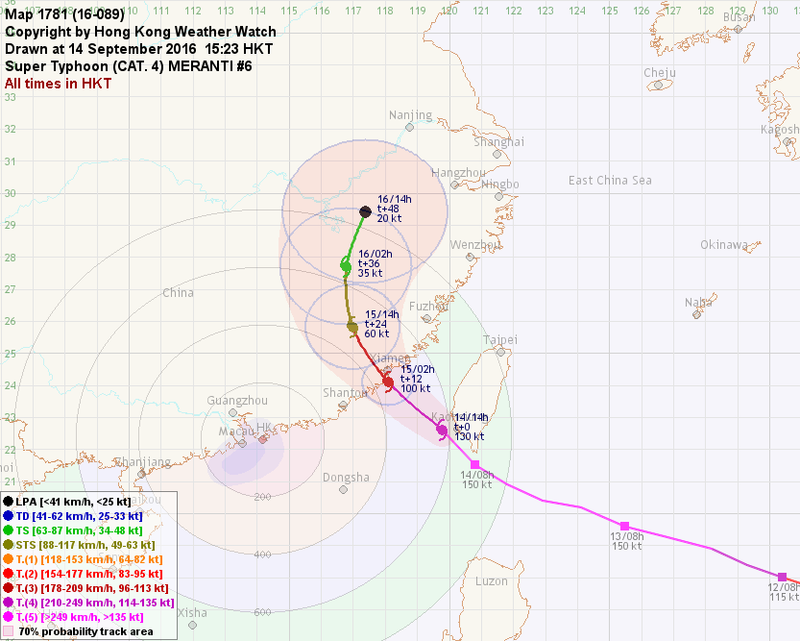 At 2 pm, MERANTI was centred about 210 km (120 NM) NW of Xiamen. The #1 Standby Signal was cancelled at 4:20 am today. MERANTI is the 106th name in the tropical cyclone name list. It was contributed by Malaysia, and is the name of a type of trees producing soft wood suitable for construction. This name was used in 2004 and 2010. MERANTI is expected to move N to NNE along the western periphery of the subtropical ridge in the next 24 hours. MERANTI is weakening quickly on land. The storm should degenerate into an area of low pressure by t+24. There might be occasional showers today, but otherwise MERANTI has little effect on the territory. This is the final bulletin on MERANTI. MERANTI has turned northwest and is now crossing northeastern South China Sea just off the coast of western Taiwan. It has also weakened into category 4. At 2 pm, MERANTI was centred about 50 km (25 NM) W of Kaohsiung. The HK Observatory issued the #1 Standby Signal at 10:10 am today. The subtropical ridge is seen building to the southeast of MERANTI, and has weakened to the west of the storm. This is the likely reason for the storm to turn northwest earlier than predicted. MERANTI will move northwest turning to north along the southwestern to western periphery of the subtropical ridge in the next 36 hours, and later recurve inland. MERANTI intensified slightly last night, but its eye is now filling quickly and eyewall cloud-top temperatures have risen appreciably. With increased land interaction, MERANTI will continue to weaken before and after landfall, and dissipate inland near t+48. Very hot and hazy weather will continue to affect Hong Kong today. Northwesterly winds may strengthen slightly tomorrow (mid-autumn festival) especially at offshore areas and on high ground. MERANTI's outer rainbands may also bring showers to the territory. As MERANTI turns northwest sooner than expected, higher signals are deemed unlikely at this point. MERANTI intensified into the second category 5 super typhoon this year yesterday, and is moving steadily towards the Luzon Strait. 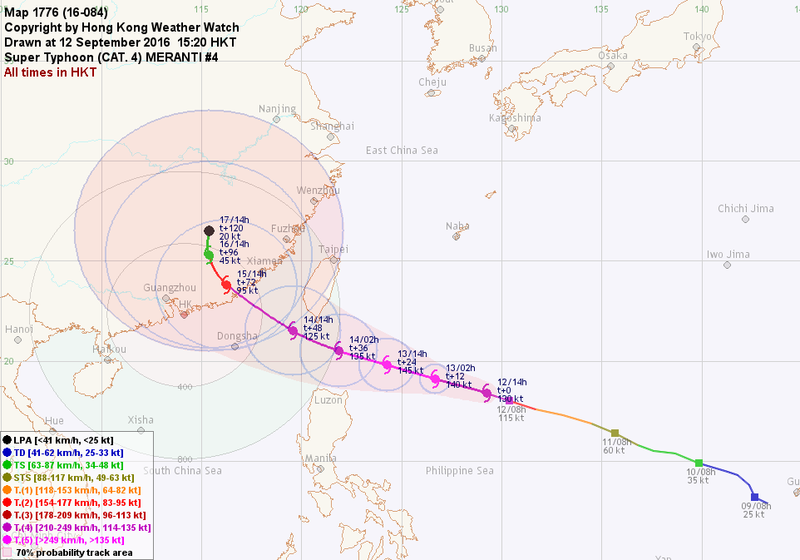 At 2 pm, MERANTI was centred about 480 km (260 NM) SE of Kaohsiung. MERANTI will continue to move WNW along the southwestern periphery of the subtropical ridge in the next 24 hours. As the ridge retreats ahead of a propagating trough, MERANTI will turn northwest after t+24 and move towards the Guangdong-Fujian border. The storm is expected to turn poleward inland as it moves along the western periphery of the weakened ridge. Interaction between MERANTI and MALAKAS is deemed unlikely at this point. MERANTI's central dense overcast continued to deepen last night and is currently assessed at 150 knots (278 km/h). 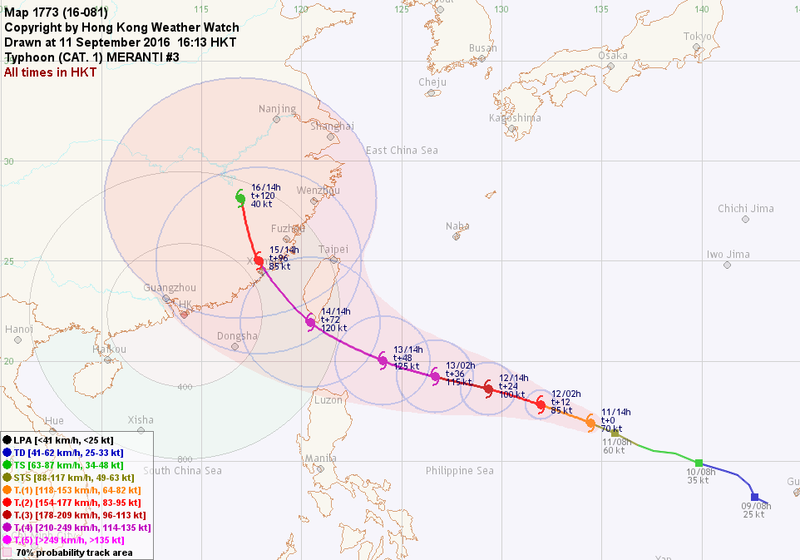 The storm is expected to weaken as it experiences land interaction, but it will still enter into the South China Sea as a violent typhoon unless it takes damage by making landfall at Taiwan. MERANTI should continue to weaken steadily in northeastern South China Sea, and the rate of weakening will increase after landfall. MERANTI's subsidence will result in very hot and hazy weather in Hong Kong tomorrow. Northwesterly winds are expected to strengthen on Thursday (mid-autumn festival) as the storm draws near. There will also be squally showers which may last until the weekend. MERANTI is experiencing rapid intensification and is now a category 4 super typhoon. At 2 pm, MERANTI was centred about 1050 km (570 NM) ESE of Kaohsiung. MERANTI is expected to move WNW along the southwestern periphery of the subtropical ridge in the next 48 hours. A mid-latitude trough is expected to arrive near that time and the ridge may retreat somewhat, allowing MERANTI to take a poleward turn. Apart from the uncertainty associated with the timing of the ridge's retreat, the developing 18W may also influence the development of the subtropical ridge. Some models are even predicting interaction between the two systems, but we consider this scenario unlikely at this point, at least not before MERANTI makes landfall in southeastern China. MERANTI has developed a solid central dense overcast with a small eye at the centre. The storm is in a pool of very warm waters (29 to 30 degrees) with little shear and decent divergence, and further intensification is likely in the next 24 hours. At that point, MERANTI is expected to reach the peak intensity supported in the region, and should start to weaken as it is influenced by landmasses. 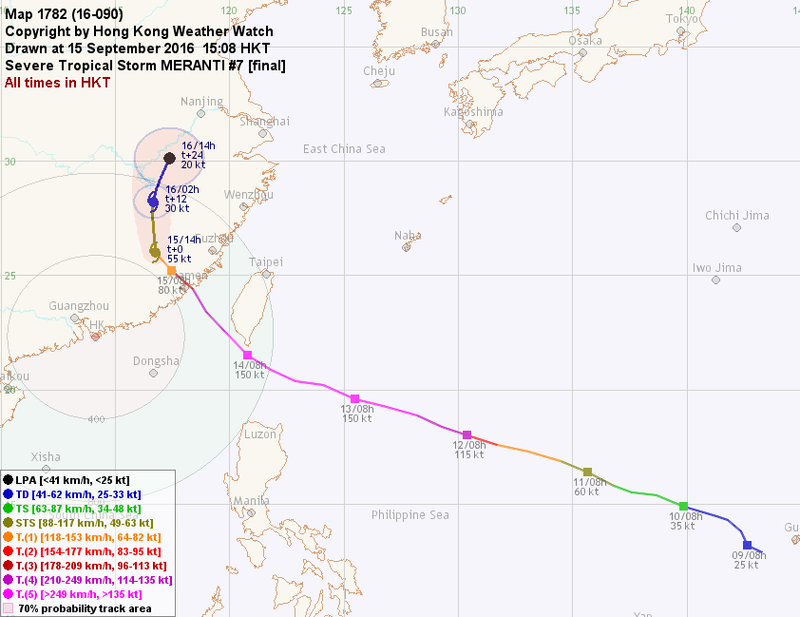 Rapid weakening should follow after MERANTI makes landfall in southeastern China. As MERANTI approaches the Luzon Strait, its subsidence will result in very hot and hazy weather in Hong Kong tomorrow and on Wednesday. Squally showers will become more frequent on Thursday when MERANTI gets closer. MERANTI has gradually intensified into a typhoon. At 2 pm, MERANTI was centred about 1620 km (870 NM) ESE of Kaohsiung. MERANTI is expected to move WNW along the southern turning to southwestern periphery of the subtropical ridge in the next 72 hours. A mid-latitude trough is expected to arrive near t+72 and the ridge may retreat somewhat, allowing MERANTI to take a poleward turn. There is some uncertainty in the timing of the ridge's retreat, but the numerical models are showing better agreement than yesterday. MERANTI's is intensifying quite fast thanks to the low vertical wind shear and warm sea temperatures in the region. The storm will continue to intensify in the next 48 hours, with the possibility of rapid deepening. 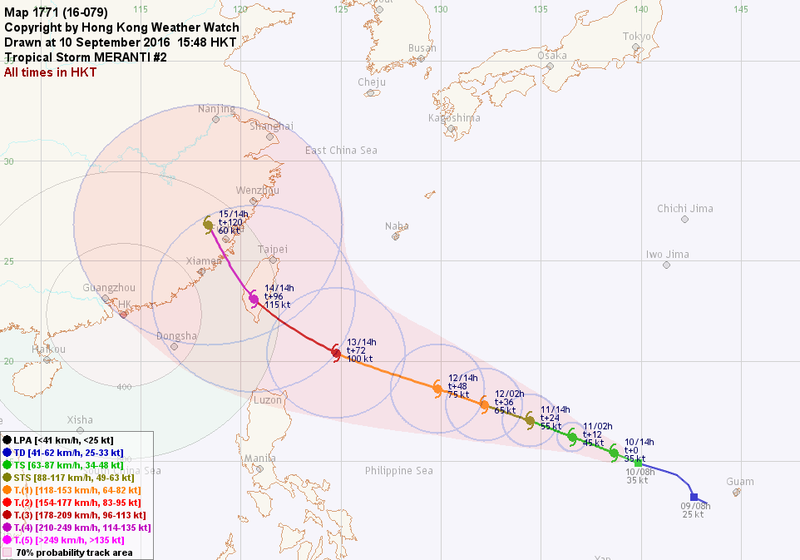 Thereafter, MERANTI's strength depends on whether it tracks across Taiwan as it turns north. As MERANTI approaches the Luzon Strait, its subsidence may result in very hot and hazy weather in Hong Kong on Tuesday and Wednesday. 16W has intensified into a tropical storm, and was named MERANTI. At 2 pm, MERANTI was centred about 690 km (370 NM) WNW of Guam. MERANTI is expected to move WNW along the southern periphery of the subtropical ridge in the next 72 hours. At that time, a mid-latitude trough is forecast to propagate eastward in northern China and erode the ridge, allowing MERANTI to recurve. Numerical models are predicting a stronger ridge than yesterday and thus the forecast track is shifted to the west accordingly. MERANTI's low-level circulation centre is partially exposed with most convections displaced to its south. Vertical wind shear is expected to decrease; as the storm moves move into a pool of warmer waters, intensification is expected in the next 72 to 96 hours, with a chance of explosive deepening near t+72. Tropical disturbance 98W near Guam has intensified into tropical depression 16W. 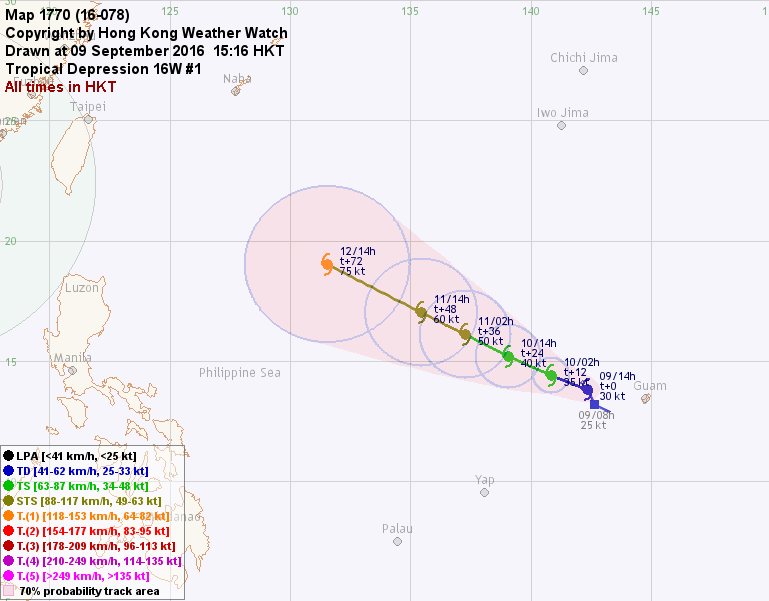 At 2 pm, 16W was centred about 260 km (140 NM) W of Guam. 16W is situated in the southern periphery of a broad subtropical ridge. As the ridge strengthens north of 16W, the storm is expected to move WNW in the next 72 hours. 16W is showing decent banding signature but its convections are rather loose. It will move into a pool of warmer waters and atmospheric conditions are conducive to tropical cyclone development. 16W should strengthen steadily in the next 72 hours.